Water conservation starts at home, where our daily use of tapware, showerheads, dishwashers and toilets all add up to some unsightly numbers. Fortunately, you can dramatically reduce your water usage through helpful tips you can use throughout your home. Swap out your showerhead with a WELS 3 Star rated water-conserving showerhead and you can save more than 29,000 litres of water per year. Fix leaky taps and install tapware with water-saving aerators to effortlessly save hundreds of litres of water per year. Use the appropriate water level and load size on the washing machine when doing laundry. Consider purchasing a front-load washing machine. The bathroom accounts for most of our indoor water consumption. Toilets, showers and taps often steal away more water then we need but you can still maintain optimal cleanliness with powerful fixture performance. From dishwashers to long-running taps, we often take the water flowing through our kitchen for granted. 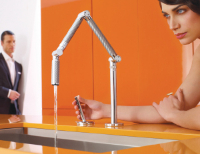 View tips and shortcuts that will help you to use your kitchen water efficiently. The Water Efficiency Labelling Scheme (WELS) is designed to provide information to consumers buying products that use water. All WELS products must carry a WELS label showing the water consumption exhibited as a Star Rating (The more stars the more water efficient the product). The information is displayed on a label to help consumers choose products that use less water but still provide a satisfactory level of quality and performance. The label is generally found on the product or price ticket. For plumbing purposes, WELS products are taps (excluding Bath taps and spouts), showers, toilets and urinals. It's important not to waste water, particularly in parts of the country that experience periodic water shortages. Conserving water can reduce your water charges if you live in an area that uses water meters, and choosing a product that uses less heated water will help to reduce your energy bills. Reducing water demand also lowers costs to the community for water treatment and pumping. In other words, using water more efficiently has both economic and environmental benefits. There are many factors that influence your decision when buying a new product such as cost, colour, brand, style, performance, reputation, recommendations and past experience. Saving water and saving on your water bills can be a deciding factor in determining the type of product you buy. If you're about to buy a water-using product find out first how WELS water efficiency ratings can save you money and help the environment. It's simple - the more stars on the WELS label, the more water efficient the product is.